Adding them for matting and layering to you creations can make all the difference. You can purchase them ready cut out for you, or the best and cheapest way is to cut your own over and over again from the dies you buy. Although not a cheap pieces of equipment to buy initially dies can save you money in the long run especially if you make lots of cards with the same theme. It is cheaper to buy one die that you can use over and over again. If flowers are your thing then you can cut hundreds of flowers from the many different flower shapes that you might like. There are lots of different machines on the market too, and the prices vary from model to model. It is versatile because it will also take the dies from other companies too ... but it only has the small A5 cutting platform. The dies for the machine are all different shapes. 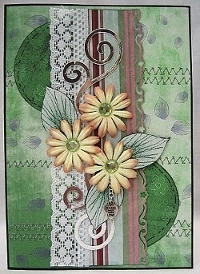 One of my favourites makes the swirls that I like to use on my cards. This is such a useful addition to cards for any age group. It can be cut out of silver (as as in the picture), gold, glitter card, or just plain colours if you choose. 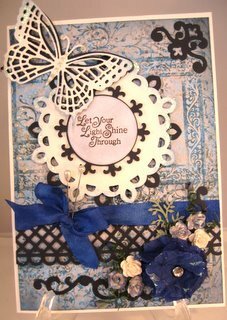 But when used together with other embellishments it can make a stunning card. Play around with the dies that you like but remember they aren't cheap, so choose carefully and make sure you will get good use from the ones you decide on. 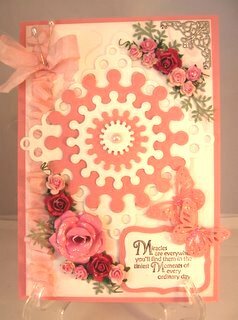 Spellbinders dies are an excellent way to produce toppers for your creations. Add them as the complete focal point to your card for a stunning look. Just dry place it on the card to see what you prefer and when happy with the effect then glue it in place. Most of this card has been created using only shapes. And take a look at some of the Novelty Cards that can be made with some simple cut shapes. 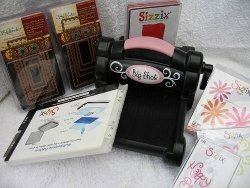 There you will find some really fun projects for you to do and the kids will love them too..
Do remember that there are lots of different kinds of die cutters and the dies that go with them, so shop around. The internet is always a good source to browse around.